"Nineteen-year-old Walt's muscles ached from felling trees to clear a break for the fires raging up on Dead Horse Ridge. As he read his camp newspaper, Happy Days, and dug into the free lunch in the mess tent, he marveled at the thirty pounds he had gained in a few short months. The weight gain filled out his face, oddly haggard for a teenager. In Montana, he climbed Glacier Park's mountains and cut through undergrowth in Flathead National Forest. Sometimes he planted trees. Sometimes he cut them down. He carved out trails that snaked up the Rockies and built fire lookout towers. He learned to love the outdoors, the food, and the work. Like most boys of his gener­ation, Walt had been hustling for as long as he could remember. When he graduated from high school in New York in 1934, there were no jobs. He joined the federal government's Civilian Conservation Corps (CCC), where a young man could put a canvas roof over his head, eat three meals a day, make $30 a month, and send $25 of it home to his family. The con­trast between the streets of New York and the trails of Montana could not have been starker. "Unlike Walt, Ray didn't bother to finish high school in California before joining the CCC. He knew that a diploma didn't count for much when there was no work available. His single mom's music store had gone bankrupt. When the tall and rather austere teenager was sixteen, the CCC taught him the 'meaning of hard work, the joy of a job well done, while being paid for it.' Like Walt, Ray gained weight and his body became 'hardened ... and [his] sense of self-respect returned.' He learned carpen­try and construction techniques and built a fire tower and bridges on Mount Shasta. 'Mostly, I learned about this great country of ours,' Ray recalled. "Bob chose to join the CCC because he had run out of choices. The son of a Norwegian immigrant widow living in Bridgeport, Connecticut, by the time he was fifteen he had been thrown out of three schools in three states. He took to the road, hoboed around the country, and ended up digging ditches for the CCC. Bob may not have lived in the glorious wilderness that Walt experienced or developed the deep love for America that Ray did, but his enlistment in the CCC probably kept him out of jail. One Chicago judge reckoned that the CCC had accounted for a more than 50 percent drop in juvenile crime in his city. And the CCC changed Bob's life too, since his stint landed him in California, where he turned his smoldering good looks and bad boy persona into a career. "Civilian Conservation Corps workers Walt, Ray, and Bob -- Walter Matthau, Raymond Burr, and Robert Mitchum -- became three of Holly­wood's biggest stars. 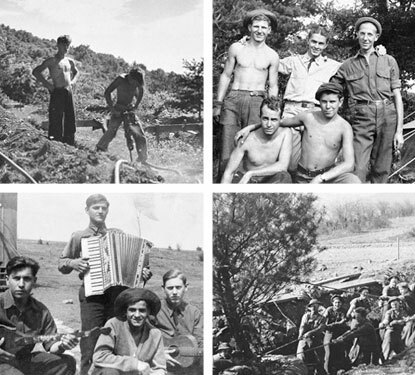 The CCC saved a generation of young men -- it repre­sented the New Deal's effort to put Americans back to work."